1. Finish shaping back case. 2. Play around with some environment reflection on the color buttons. 3. Shape a complete cord with socket. Last edited by FirebrandX on Thu Mar 12, 2009 2:09 pm, edited 10 times in total. Freaking beautiful! I'd love to see more. What types of files can that software you're using output? Also, where did you learn such awesome skillz? I'm envious. Also, you might think about providing the source files, just to keep things in the spirit of open source. And to dispel any thoughts that you're photoshopping any photographs. No problem at all on the model files being open source. When I finish the entire controller, I'll post the model file for download. Beware though its formatted for 3DS Max 2009 64-bit, which is a very expensive program. I suppose an alternative is for me to render a wire frame version, which is easy enough. 3DS Max can output the render image in any number of formats, including full-motion video. I just use jpegs for preview imaging. When I want to make pngs or gifs with opacity settings, I load up photoshop and edit the bitmap render from there. As for the skills thing, thanks for the compliment, but I'm barely above beginner level using the program. There are very proficient artists/experts of 3DS Max or Maya that make my work look nearly pathetic! I always drool over their web site galleries, and thankfully some are willing to share tips & tricks. My own web site with some of my 3D work is of course http://www.firebrandx.com. One trick I am using for the curved edges is something I picked up from learning how POV-Ray Legos were rendered. They would use tube-splines around edges to remove sharpness. I'm doing the exact same technique here, because its a heck of a lot easier than trying to manually fillet complex curves and tight corners. I agree, also, again, too much black.. Location: Given the proper amount of time, anywhere. lol, you even drew the little notch. Good job. Definitely looking forward to your conceptual renderings of the other peripherals, as well as the controller. I still must say that I liked FitzRoy's surreal controller over authentic stuff. But yeah, going with an accurate emulator, an accurate representation of the real controller is a better choice. I'm honestly not sure if I'd know that was rendered, if you didn't say as much. I updated the progress image. Just some more work on the outer shell casing. I still need to add in the little notch at the top where the cord comes out, and also need to apply the Super Nintendo logos & text to the casing. Then all that's left is the middle buttons, crosspad, shoulder buttons & the cord. From there, I will probably switch to a white background and render some radiosity shadows. nice progress, can't wait to see further updates. Anyway, it ended up working out for the better because now I have more control over the lighting on the crosspad. When you use bitmap textures, there tends to be leftover lighting from the texture itself that will skew the model's reflected lighting. That's all for tonight. Hitting the sack and then I'll finish the sucker up tomorrow. You really do an awesome job. Seriously, you could do this the whole time I was struggling to make one in a 2d environment? What's wrong with you? Super scope is going to be 10x harder, though, if you dare. I've nearly finished the controller as you can see from the updated preview. About the only thing that I'm nitpicking myself over is the font logo. If somebody can find an even better font match, I'd be quite greatful. The current one I'm using is a modified Eurostyle font, which is very close to the SNES font, but not an exactly perfect match. I guess I'm being obsessive after working on such tiny details. Wow, I was stunned when I first saw this latest version. Now that I'm over the sheer beauty of it, is there any way you could make the gap that exists between the D-pad and the shell anymore defined? Right now it sort of blends into the D-pad, which makes it look a bit flat. Same goes for start and select. This is all extreme nitpicking, of course. You're right about the font, it's a bit more rounded than the original, but it's not too noticeable. Most of the issues you listed are a result of the camera setting I used. Its set to a very low field of view of 20 degrees, which causes the crosspad and the middle buttons to lose a little depth. Its also creating the illusion of the shoulder buttons tapering. If I go to a default 45 degree view, the crosspad & buttons will stand out more, but you'll feel like your face is being rammed into the middle of the controller when you look at it. I could stand to move the shoulder buttons up a little, though I stress their position is in accordance with a real controller overlay I used as a guide. I'll play around with a few of these things and see how it turns out, though right now I've got a finish a book cover I was assigned that I'm a bit behind on. The "SUPER NINTENDO" font should be narrower. Last edited by kick on Wed Feb 18, 2009 3:28 am, edited 2 times in total. Actually its the exact same narrowness as the real controller (spacially speaking). The font itself is the problem, and was part of my request for a better font if anyone finds one. * The D-PAD and the rubber SELECT/START buttons are not that shiny. * The D-PAD and the grey around the YXBA buttons have a fine texture. * Increase the reflection of the YXBA buttons by adding concentrated "glaring" spots in the center of the specular reflection. Could you render it with a white background (or as a 32-bit PNG) so that it's closer to the wiki picture? Amazing work! I'd be hard-pressed to notice any differences from a real controller unless I was comparing them side-by-side. What's the best way this graphic can be stored and displayed in bsnes? Last edited by Jipcy on Wed Feb 18, 2009 12:53 pm, edited 1 time in total. Yes, this step is listed on my things left to do. 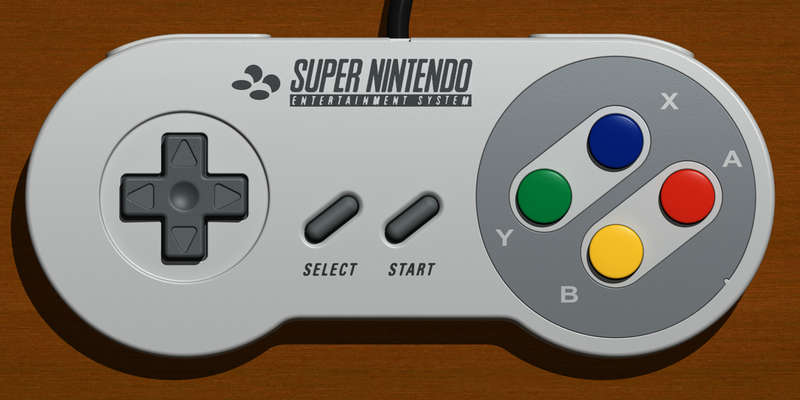 I really need to do a better font of the "SUPER NINTENDO". If worse comes to worse, I can actually hand-render each letter and get it spot-on that way. I'll also work on a few tweaks here and there as other people listed, but eventually it will come to the point where there will be disagreement between one person and the next over stuff like how much polish should be on the buttons or how much bump mapping should be on the cross pad. There's only so far I can go with my limited skills as it is, so I will call it done at some point when I'm personally satisfied with it. Anyway, I'll update the things to do list after posting this.